Each year I make my self a large personal bowie to go play with. Why? So I can use it hard, abuse it if need be and often times play with a new technique. This is so when I am talking with you I can be honest and say what they will and won't do. I hear a lot about "You can't use a pretty knife", or "That's and art knife, not a user". So, this year I decided to make a nice bowie for the Micro show attendees to use if they wish. They can chop wood 2x4's in half, they can cut soda pop cans, bottles of water or rope or anything else that we cut in our Micro show Knife Rodeo that we put on. After using my knife they can decide for themselves if they want to use theirs or not. 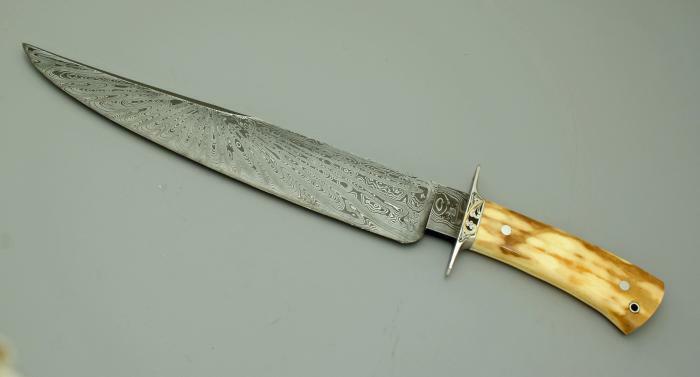 This one is Damascus, walrus ivory, engraved with gold inlay. I want them to test the engraving as well. The folder I have carried for the last 14 years is engraved. I put it through all types of work and the engraving holds up well. But it is not for me to just say, it is for me to put one in peoples hands and let them see for themselves. That's what it is all about. I made the damascus with a Dog Star pattern and have the center of the star set to where the sweet spot is on the knife so they will learn this is where you get the most good from the 'whumf' when you cut.